Share the post "Power-Con 2019 Cosplay Contest"
Power-Con wants to see you bring your favorite Masters of the Universe and Princess of Power characters to life. Are you ready to scare the masses with your Skeletor? Impress the audience with your She-Ra? Now’s your chance. For 2019, we have two age groups that can win almost $2000.00 in prizes! Click here for more details on how to enter. We can’t wait to see you in your cosplay! Share the post "Power-Con 2019 exclusives revealed!" We are proud to reveal the exclusives for the 2019 Power-Con show! Please note that the product you see here is not final, and subject to change including, but not limited to, accessories, colors, and details. This 3-pack completes the release of the MOTUC figures inspired by the unreleased 1988 vintage concept wave. The packaging will feature brand new artwork and bios on the back and come in a window box displaying all three figures. This mind-controlled version of He-Man rises from the ooze of the Slime Pit to do Hordak’s bidding! He comes on the standard MOTUC blister packaging, with brand new character art and bio on the back. 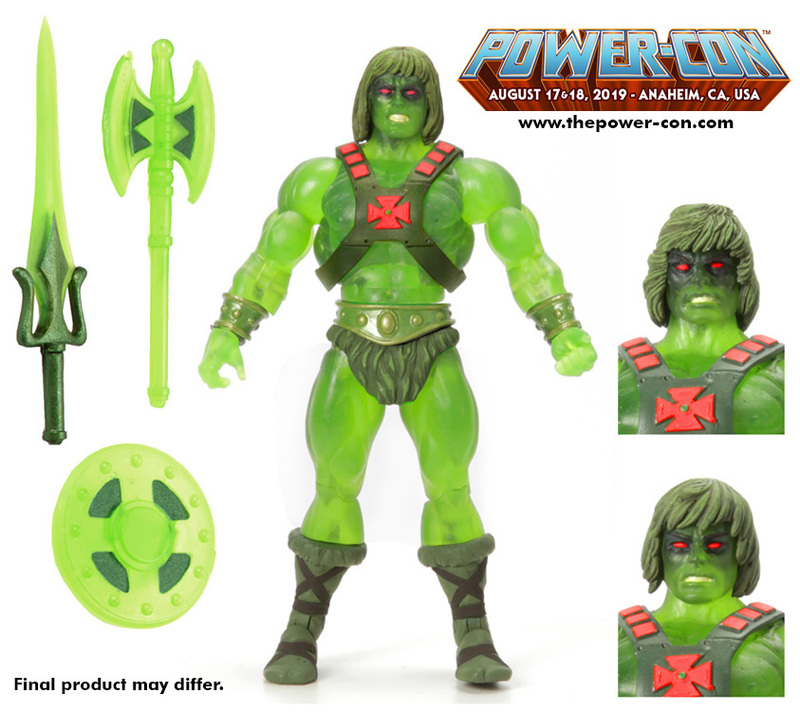 For the Honor of Grayskull, the 12″ line continues! Fans were treated to the 12″ Adora / She-Ra release at SDCC in 2016. Now fans can get a limited edition 12″ Starburst She-Ra to add to their collection. This figure comes on a full-face blister with a removable card back that pays homage to the vintage She-Ra packaging. This enables you to display your 12″ figure loose, or put her back into the packaging and display her that way. 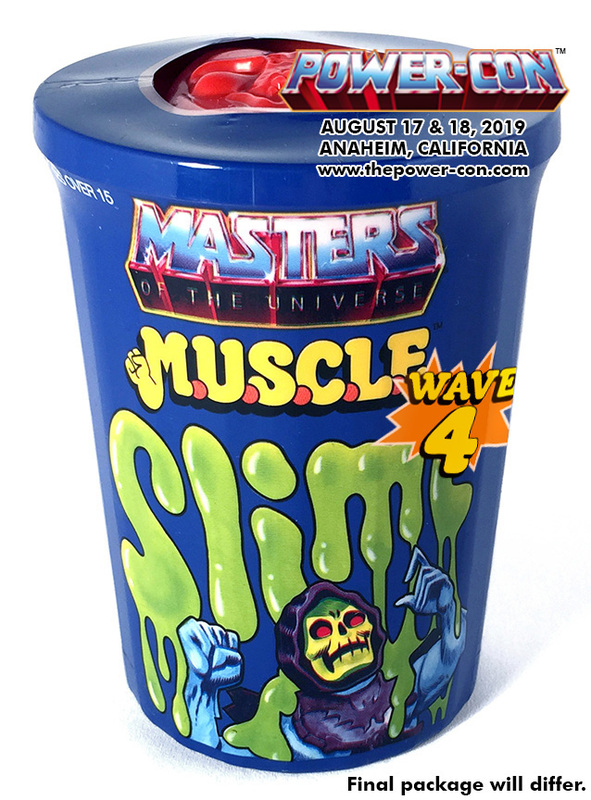 Using the MUSCLE seen in the Keshi blind bag releases from Super7, this Slime Can collects from that assortment and presents them in the Power-Con slime colors like in previous years. There will also be an assortment of souvenir t-shirts for Power-Con. Designs and info will be revealed soon! Pre-sale of Power-Con attendee tickets and exclusives begins Saturday, March 9th at 9am Pacific time and end Sunday, April 7th. Any remaining stock after Attendee pre-sales end will then be offered through our resale partners on Monday, April 8th through Sunday, May 5th. Our resale partners will be BigBadToyStore in the USA and S.P.A.C.E. (in conjunction with Die Welt der Meister Magazin) in Germany. The 2019 exclusives are not made-to-order, and are instead being produced at a set quantity that is lower than previous items, so all exclusives are subject to selling out. We will post the pre-sale link and more info as we get closer to March 9th. Thank you for your support of Power-Con, and we can’t wait to see you in Anaheim, California this August 17th and 18th to celebrate all things He-Man and She-Ra! 95% of Power-Con’s discounted hotel rooms are gone! Share the post "95% of Power-Con’s discounted hotel rooms are gone!" Even with a sizable discounted room block, Power-Con has sold 95% of its discounted rooms in just three days! Once those sell out, Attendees will need to reserve rooms at the regular hotel rate, or at nearby hotels. Reserve your room for Power-Con with the discounted Power-Con rate at the Hilton Anaheim, the headquarters for where the convention will take place! Click here to visit our Hotel & Travel section for links and more information. We look forward to seeing you this August 17th & 18th in Anaheim to celebrate all things He-Man and She-Ra! Share the post "Discounted room reservations at the Hilton Anaheim are now open"
You can now reserve your room for Power-Con with the discounted Power-Con rate at the Hilton Anaheim, the headquarters for where the convention will take place! Click here to visit our Hotel & Travel section for links and more information. We look forward to seeing you this August 17th & 18th in Anaheim to celebrate all things He-Man and She-Ra!